The Transfer Center, packed with students trying to make application deadlines, was evacuated. 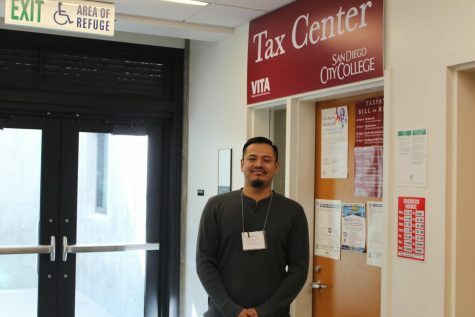 San Diego City College President Ricky Shabazz said he was meeting with campus administration leaders discussing budget issues when the lights turned off. Someone immediately joked in the darkness, did we at least pay the power bill? 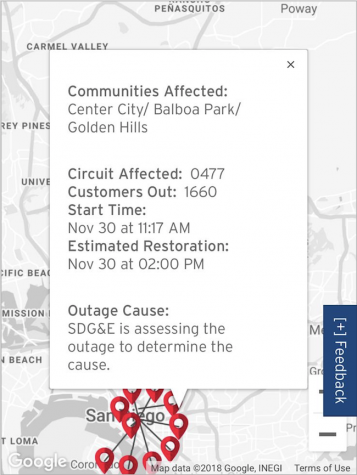 SDG&E’s online outage map from 11:38 a.m. showed a large portion of downtown San Diego was impacted by a power outage. SDG&E screenshot. The situation in the Transfer Career Center was no laughing matter. When the power went out, the center was packed with students hoping to speak with a UCSD representative. 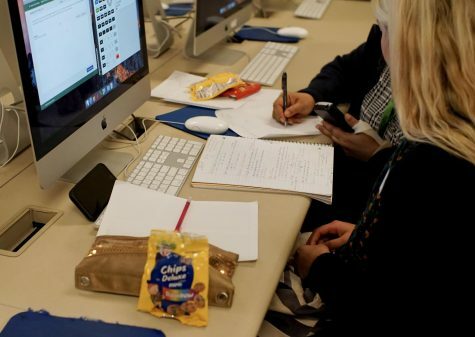 She was helping students with last-minute admission essays because University of California transfer applications are due at 11:59 p.m. on Nov. 30. 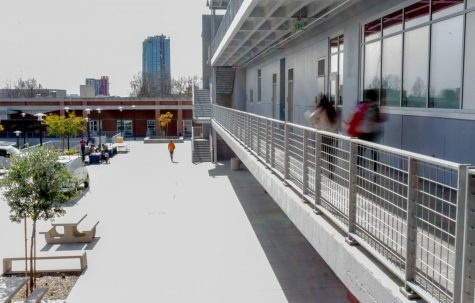 “Students who planned to get help with their draft essays are unable to do so because of the power outage,” said Ace Davis, a student support specialist. 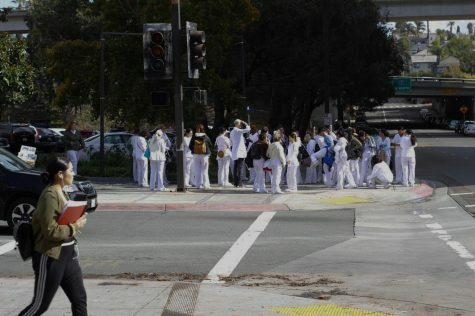 City College cosmetology students left their darkened classrooms and waited on the corner of 16th and C streets. Photo by David Ahumada, City Times. Some students were waiting around, desperate for the power to come back on. Others were trying to use laptops and mobile hotspots to finish up their essays when Nesha Savage, dean of student development and matriculation, came in and told everyone a decision had been made to close the campus and everyone had to vacate the center. 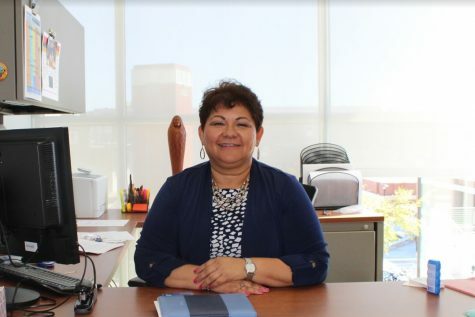 Savage apologized to the disappointed students, saying she was following a directive from the vice president of student services, Denise Wisenhunt. Savage was in the meeting with Shabazz when the power went out. The administration decided to close campus over concern for student safety. 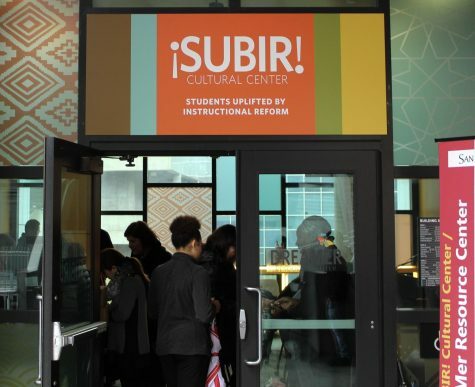 “Some of the buildings have backup generators so there is some power, but not enough to operate the college,” said Shabazz. 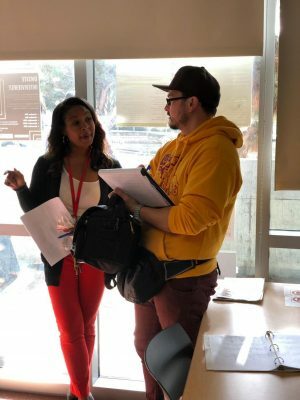 City Times reporter Brian Mohler interviewed Nesha Savage, dean of student development and matriculation, as students filtered out of the Transfer Center. Photo by David Ahumada, City Times. Students reluctantly left the transfer center. 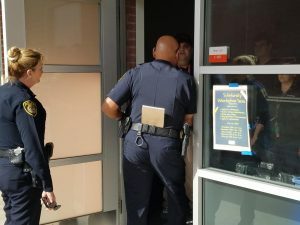 Many waited outside hoping to still speak to the UCSD representative, who stayed to talk to lingering students and calm their nerves. “I feel like a porcupine in a balloon factory,” she said. “I spent all my free time working on my essay these past two weeks. Sofia Garcia was feeling more fortunate. “I didn’t lose my essay when the power went,” she said. Garcia wants to study literature and was working on her application to UCSD. She already got her application in for SDSU, ahead of the deadline. The California State University priority application window was also set to close at 11:59 p.m. Earlier this week, the CSU system, which includes SDSU, extended its deadline until December 15 due to wildfires affecting students and their families throughout the state. Sociology student Aida Guillen said she was grateful for the extension because she’s been experiencing her own hardships recently. She planned to apply to CSU campuses in Chico State, Stanislaus, Humboldt and San Francisco. “I had my essay questions finished early,” said Guillen. “But my laptop was stolen the Friday before Thanksgiving break. “Everything was closed that week and I had problems accessing a computer to work on it. I borrowed a computer from my sister but it didn’t have Word and (I) wasn’t familiar with the program I was using. Guillen didn’t lose her work this time but was one of the students hoping to get last-minute help with her essay for applications to UC campuses in Berkeley, Riverside, Santa Cruz and Santa Barbara. 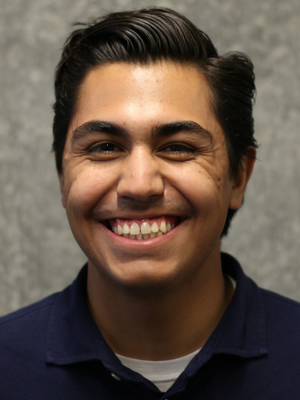 “I wish the UC system would extend its deadline too,” Guillen said. 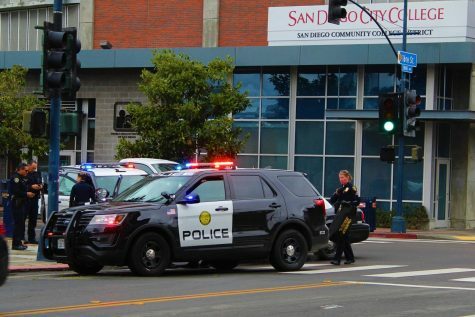 SDCCD police went from classroom to classroom, notifying students that campus was closed. Photo by Brian Mohler, City Times. Fridays are typically slower on campus, although the 6th annual Student Leadership Summit was taking place and had to be cut short. 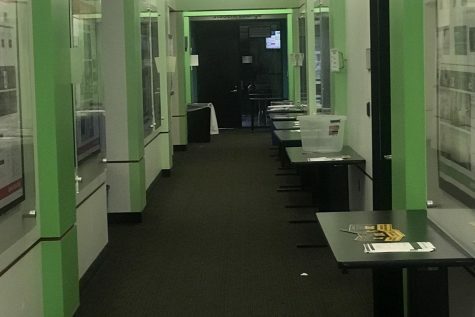 City College radio station Jazz 88.3 was still running after the power went out, but staff reported battery power could only carry them for an additional 40 minutes. Planning for Newscene, the school’s weekly 30-minute news broadcast, was interrupted when the power went out. Newscene students scrambled to recreate their news coverage plan and filming was moved to an off-campus location. 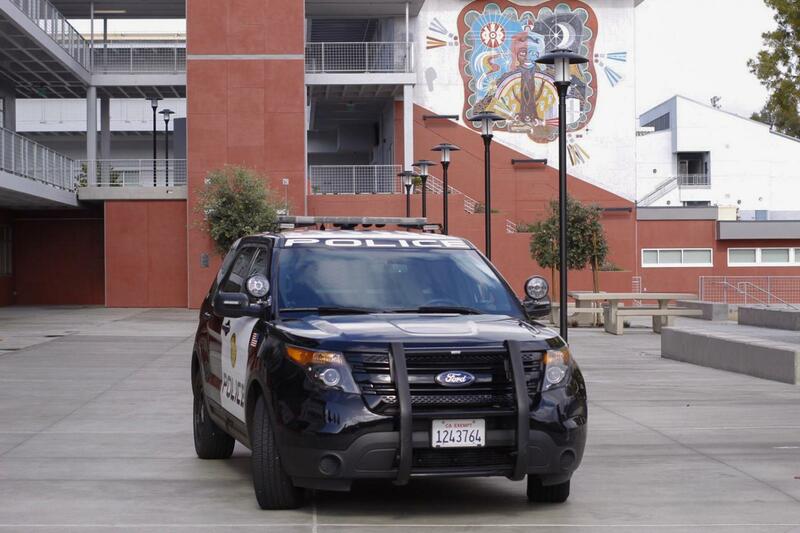 Campus police officers surveyed buildings and asked those on campus to vacate the premises. 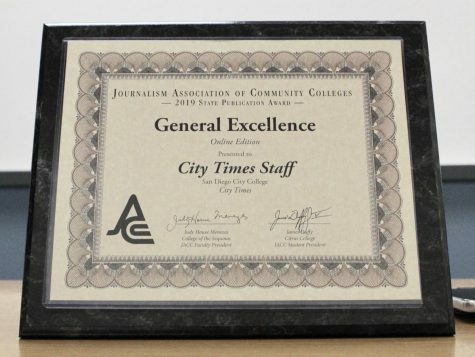 At approximately 12:40 p.m., while the Newscene staff was packing up to leave campus, some of the lights in the C building turned back on and computers rebooted. An SDG&E power outage darkened San Diego City College and a large portion of downtown San Diego, Balboa Park and Golden Hill at approximately 11:15 a.m. on Friday. Campus administrators were in a meeting at the time and decided to close the campus. Watch for an update here today and follow @sdcitytimes on Twitter for the latest info. 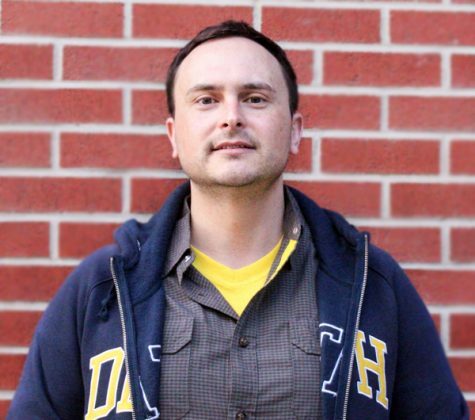 Visuals editor David Ahumada contributed to this report. 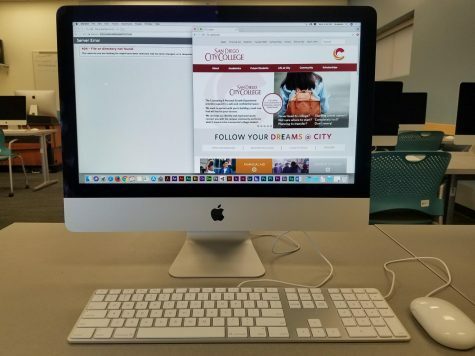 Nov. 30, 4:35 p.m.: This headline “Power outage closes City College campus” and post were updated to reflect new reporting and confirmations by City College, the district and SDG&E that power returned.